To say it was a great Christmas would be an understatement. As I look through all the photographs I took over the past several weeks, I see so many fun times and happy moments. I was about to share with you all my BEST holiday photos. But then I decided, “That’s boring!” We all see everyone’s pretty perfectly posed photos on our Christmas cards and on our Facebook pages, and yes I am guilty of posting them here on this blog. We all know that that’s not usually how real life is with kids. And sometimes seeing everyone’s happy smiling professionally photographed portraits makes me feel like everyone else’s life is more organized and their kids are more well behaved than my own. So, I decided to share with you my favorite “outtakes” instead. 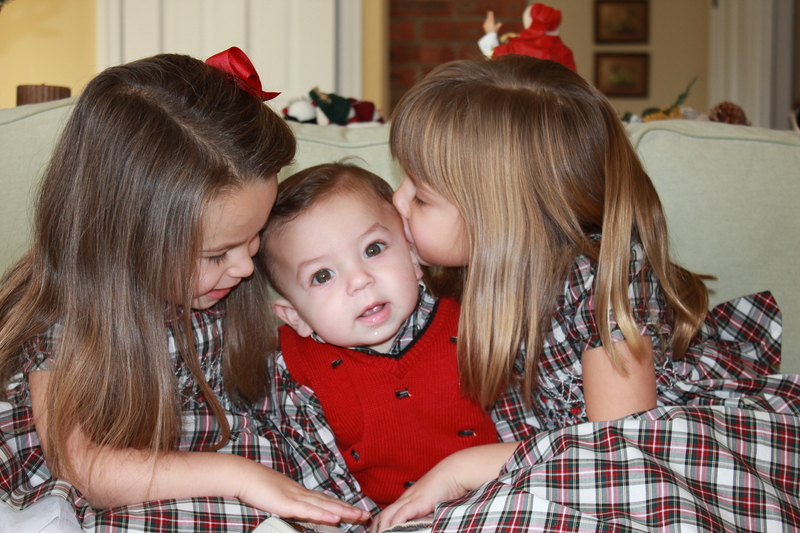 Instead of sharing my most perfectly posed photos of everyone smiling in their color-coordinated outfits, I’m sharing the candid Christmas images I will hold in my mind and my heart forever. When my children have all grown up, when they don’t wake up at 5 am to open presents on Christmas morning, when playing Santa is a distant memory, and even when they are off at their in-laws celebrating Christmas with their spouses’ families, these are some of the images that will remain in my head. The perfect ones are special too. But the REAL ones like these will help remind me of what life was really like every day. These are the ones with someone sticking out their tongue, someone trying to run away, or someone just being, well, real. Some are blurry, some are crooked, too bright or too dark. But that’s pretty much how daily life is at our house. These photos depict silliness, excitement, stubbornness, nervousness, and messiness. But most of all they capture happiness, LOVE, and genuine, PURE JOY. That is Christmas. These are some of the REAL holiday photos that I will treasure forever. And because this blog is a documentation of my life that I hope to look back at over the years, I can’t help but share the others as well. They are the pretty, framable ones. They make me smile too. May the new year bring you happiness, love and pure, genuine joy. Baking Christmas cookies; yet another example of a holiday tradition that sounds like a lot more fun than it sometimes ends up being with three young children. It’s right up there with carving pumpkins, dying Easter eggs and decorating the Christmas tree. These are all activities that sound dreamy and special, yet almost always turn bad rather quickly. At least that’s the way it goes at my house with two strong-willed perfectionists who insist they don’t need any help, until they do. Throw a mischievous two-year-old into the mix and you’ve got big trouble. Nonetheless, this year once again, I put on my Little Miss Sunshine face, hoped for the best and set out on what I hoped would be a fun adventure in baking that we would look back on with happy thoughts years from now. 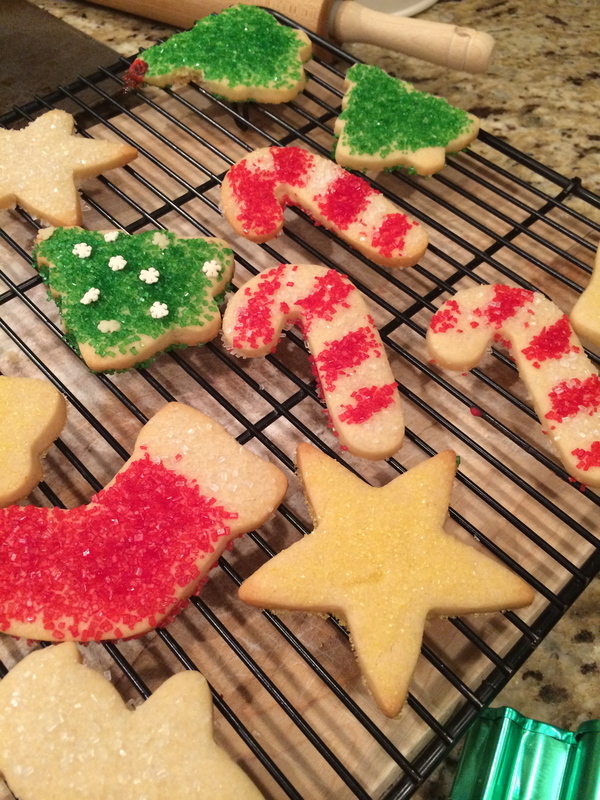 If I only have time to make one batch of Christmas cookies, Iced Sugar Cookies are it! If you haven’t made yours yet, I want to share my favorite recipe with you. Normally I like to take family recipes and those from my favorite cookbooks and celeb chefs and make them my own, by transforming them to be “cleaner” and healthier. This one is too perfect to mess with. You know the saying, “If it ain’t broke…”! Christmas goodies are one place where I don’t cut corners. This time of year, I do splurge a little and eat the real thing. 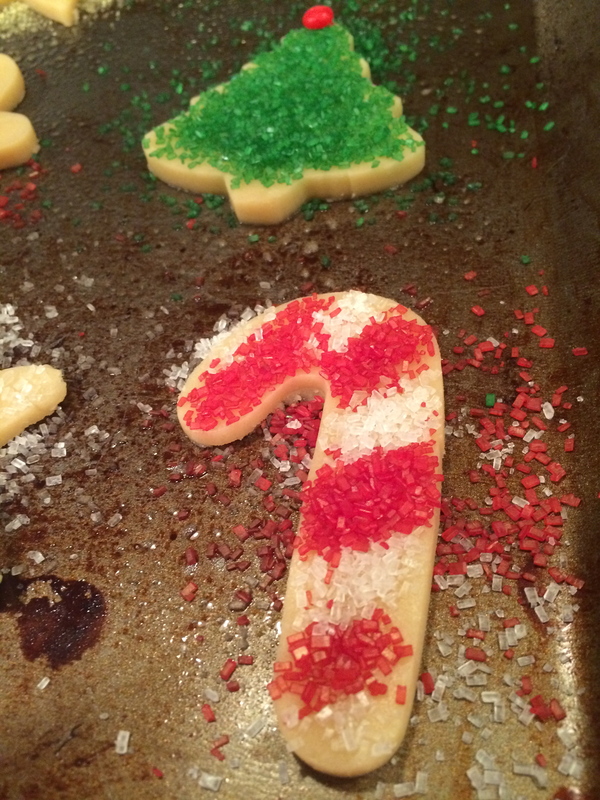 Of all the sugar cookie recipes I’ve tried, these are the BEST! They taste incredible and they look just as beautiful. They don’t lose their shape or puff up during baking so they are great for decorating. 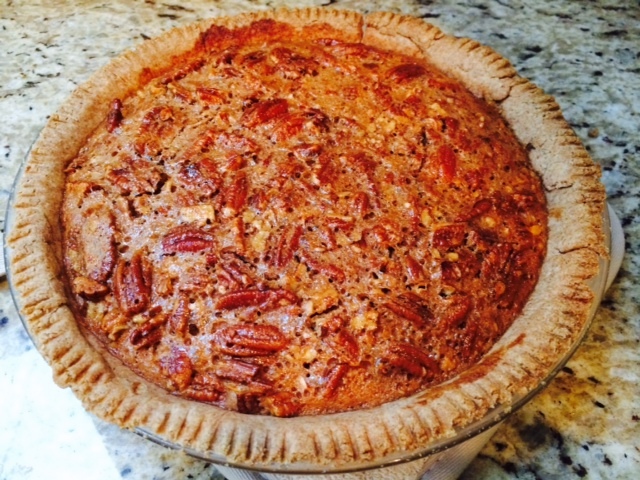 The recipe comes from the classic Joy of Cooking cookbook. My mom gave me a copy as an engagement gift back in 2004 and wrote a sweet little note inside of it that I will always treasure. Indeed today I did “enjoy it” (well, parts of it) as she suggests I should do. 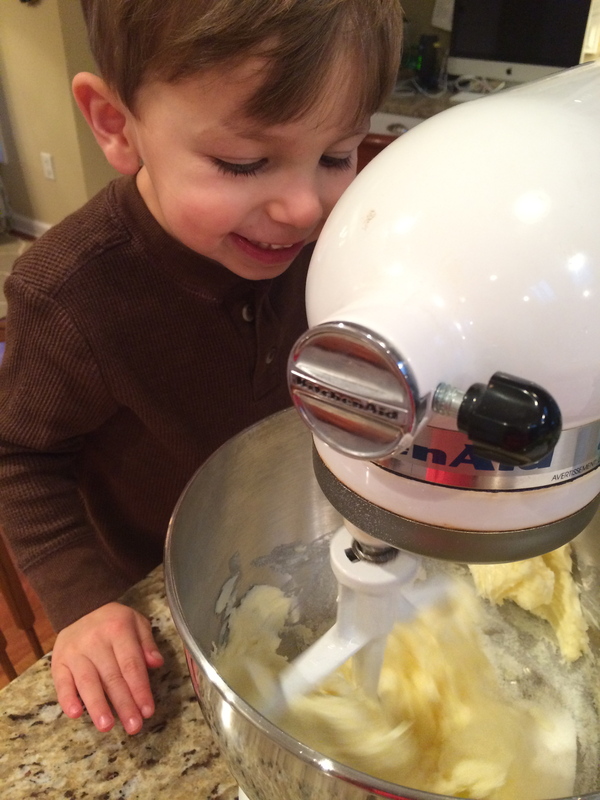 I’m certain I will always remember making cut out cookies for the first time with my baby boy, just him and me. I will also remember when he dumped the sugar all over the floor and the tantrum he had later when I asked him not to pour out any more jars of sprinkles on his plate while decorating. Quite memorable. On a side note, I also happen to have Andy’s Grandma Jane’s Joy of Cooking cookbook that was printed back in 1964. His mom passed this along to us years ago and it’s fun to open it up to see her signature on the inside cover. I wasn’t lucky enough to meet Grandma Jane before she passed away. From the stories I have heard about her, she was an amazing woman. I feel honored to have this cookbook in my home that she used to prepare meals for her own family. I haven’t been able to find the same Iced Sugar Cookie recipe in her book, but I’m sure it’s in there. Perhaps Andy’s Grandma made cookies with her children for the Jewish holidays out of this same cookbook. Fun to think about and to carry on traditions. Whisk the following together thoroughly. If your sous chef is a bull-headed two-year-old, like mine, don’t be surprised if some ingredients end up on the floor. Gradually stir the flour mixture into the butter mixture until well blended and smooth. Divide the dough in half. Place each half between two large sheets of wax or parchment paper. Roll out to a scant 1/4 inch think, checking the underside of the dough and smoothing any creases. Keeping the paper in place, layer the rolled dough on a baking sheet and refrigerate until cold and slightly firm, about 30 minutes. If you’re like me, you don’t have enough time to do ALL of these steps at once. Our dough sat in the refrigerator for a few HOURS. We came back to it after I made dinner, cleaned up and did baths. After everyone was clean, each of the kids took turns cutting out a few shapes and getting nice and messy again. 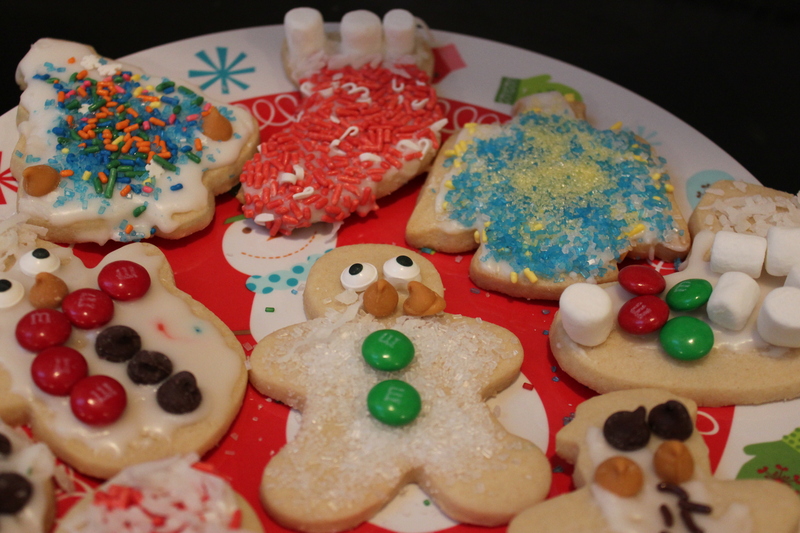 If you’re not planning to ice all of the cookies, decorate some with colored sugar or nonpareils. We decorated a dozen or so before we baked them so we didn’t have quite so many to decorate with icing later on. I find that the kids get bored after doing a few. After I put everyone to bed I baked the rest without any sprinkles for the kids to decorate later. After school the next day, I let the kids have at it and decorate the rest of the cookies. For a quick yet tasty icing, simply combine 2 cups of powdered sugar with a few tablespoons of water or milk. I was surprised by how pretty the girls’ cookies turned out. 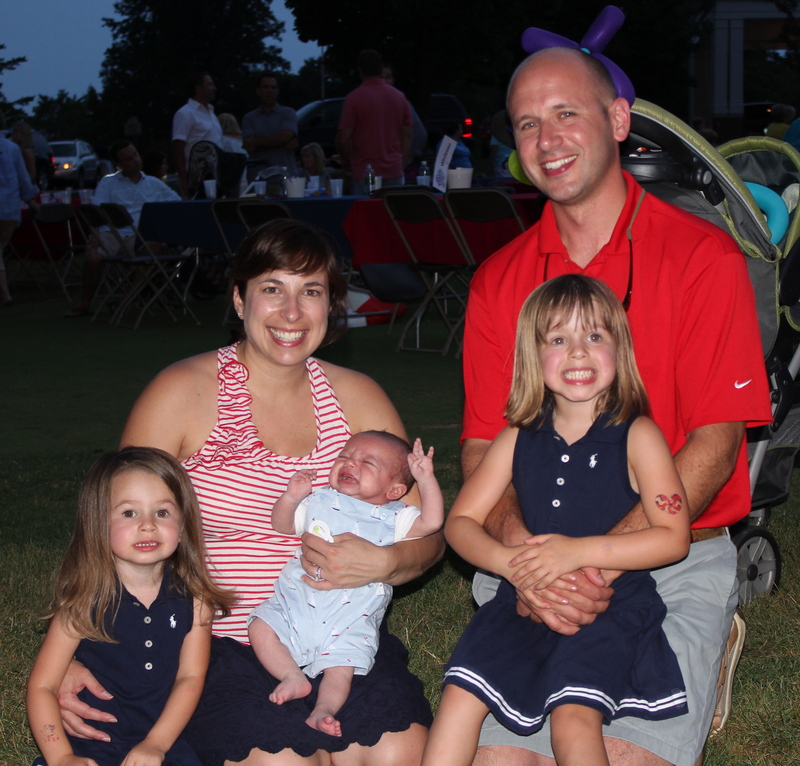 They had fun being creative and were sweet as pie, or Iced Sugar Cookies, as it were. But this is where things went south for John. He decided to swipe two or three jars of sprinkles and empty them onto his plate. When I asked him not to do anymore and took the rest of the sprinkles away, he lost it. The crying, kicking, screaming and drooling came next. Not surprising I suppose, as I recall it’s about the very same sequence of events that occurred during pumpkin carving, the tree decorating and Easter egg dying. John was “redirected” and went off to chill with his daddy while the girls and I finished our masterpieces. Now, I should mention that one of these plates of cookies is perfectly safe to eat, the other may be… well questionable. SOME of the cookies on one plate MAY have been coughed on and the icing spoon MIGHT have been licked in between spreading. Perhaps you might guess which ones. I suppose the kids don’t care. I love that in their eyes, the more sprinkles, colors and decorations, the better. 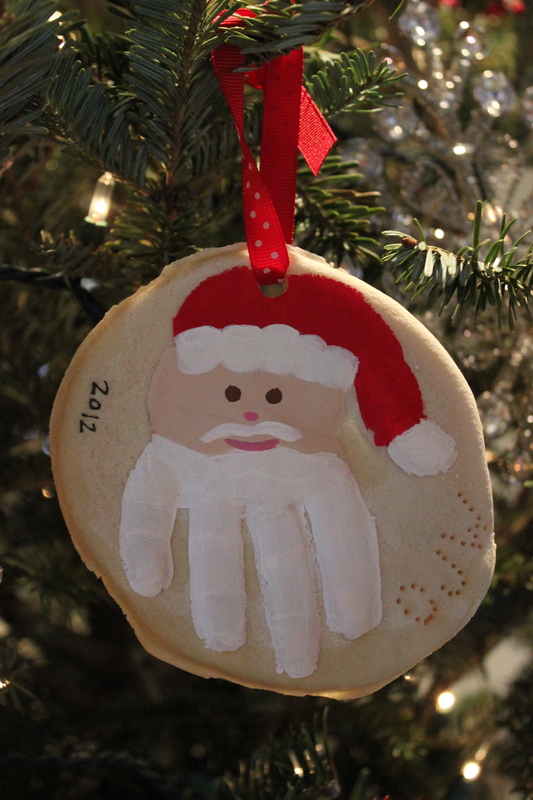 And, with that, another year of cut out Christmas cookie decorating was complete. While it did not go exactly the way I had hoped it would, it went pretty much exactly the way I expected it to go and is still one of my favorite holiday traditions. Our cookies are certainly not the most beautiful ones you’ll see this holiday. They don’t at all resemble the cookies on the cover of Martha Stewart Living. They won’t be popular on Pinterest. But they are real. They are us. In fact, they are virtually a spot-on metaphor for our life at this present time. Messy, busy, yet colorful and oh so sweet. Like our life, these cookies are perfectly imperfect. Looking for a special, home cooked meal that you can make ahead and pop in the oven on a busy evening? 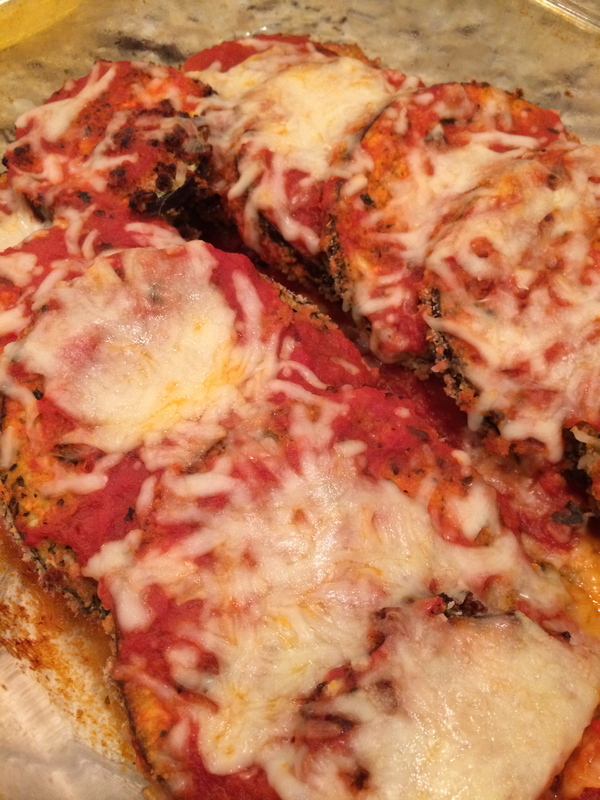 My Baked Eggplant Parmesan is perfect for those busy nights leading up to Christmas when you have family coming in town and you need to feed a crowd, but don’t want to be fussing with dinner when they walk in the door. Make this eggplant dish earlier in the day or even the day before. It is a welcome alternative to the ever-popular lasagna and since it’s vegetarian it will suit everyone’s tastes. I plan to make this next weekend when my family comes in town to watch Elizabeth dance in the Nutcracker. I’ll cook up a couple of simple pizzas for my nephews too. This dish comes together quite quickly and is always a crowd pleaser. My kids even love it. I commonly make it ahead for time crunched weeknights when the girls have after school activities. I put it together in the afternoon and when we get home from swimming or dance class, I just put it in the oven. 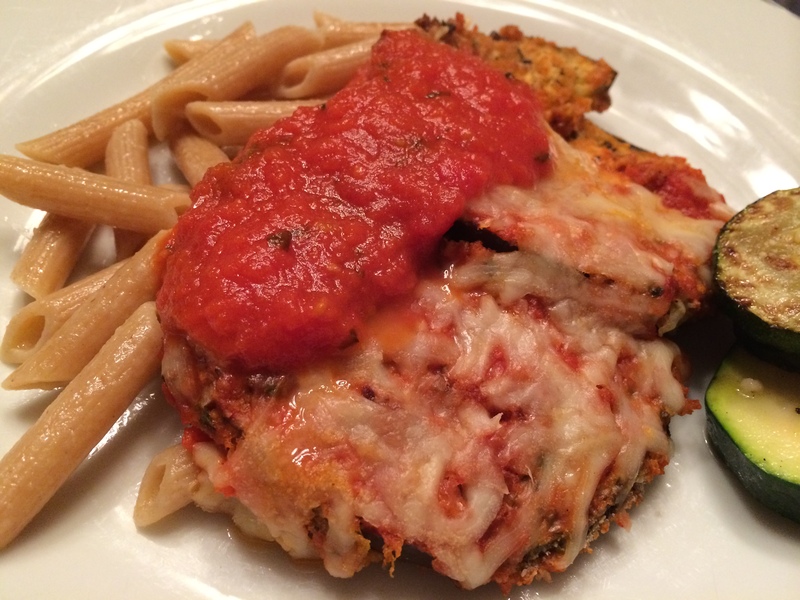 At only 171 calories per slice, it’s a much healthier version than traditional fried eggplant parm. Andy often brings home eggplant from his wholesale produce market and this is one of my favorite ways to cook it up. If you haven’t noticed, I make a lot of Italian dishes. I can’t help it, it’s in my blood. I hope you’ll enjoy it as much as we do. Turn on the broiler of your oven. Place eggs in small bowl, scramble. 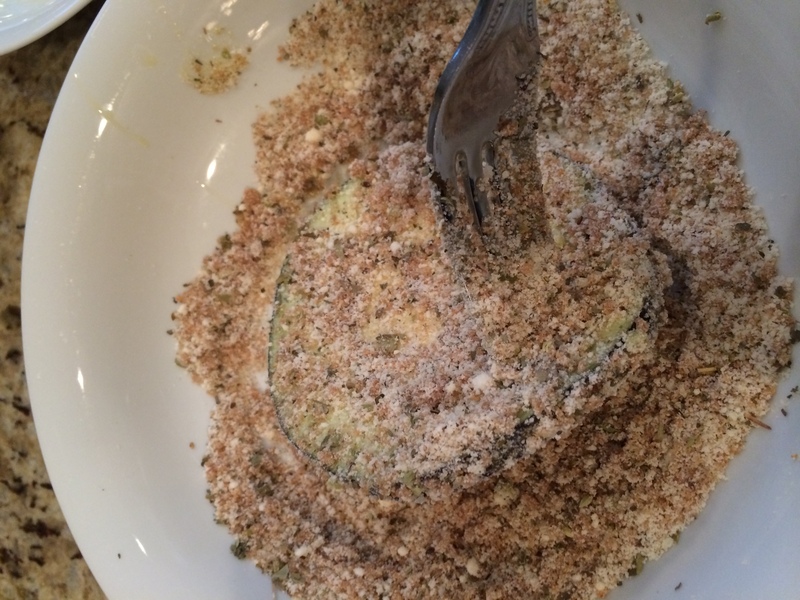 Combine parmesan, panko, basil and oregano in another small bowl and stir to combine. 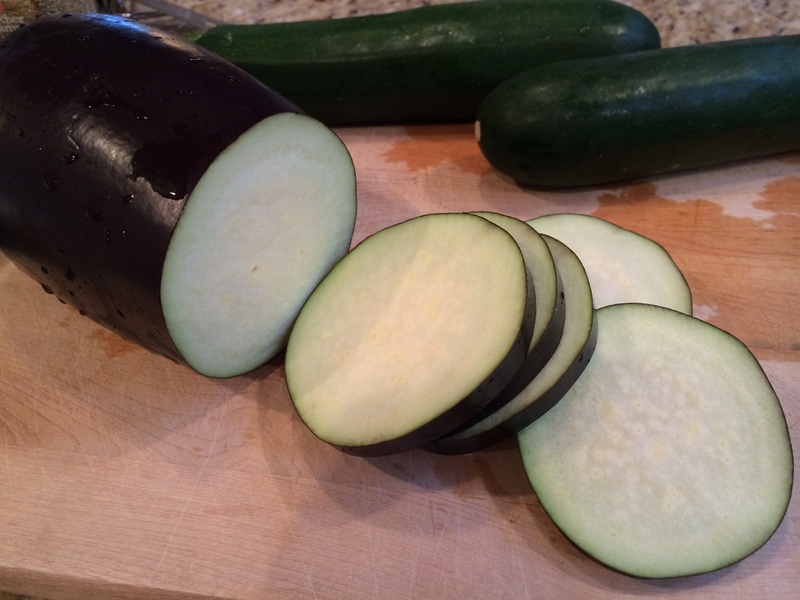 Slice eggplant into thin circles (the thinner, the better). Spray one or two cookie sheets or jelly roll pans with nonstick cooking spray. Using a fork or your fingers, dip each piece of eggplant first in the egg, coating each side. Then dip it into the panko mixture and turn over coating both sides of each piece of eggplant. Use a spoon to cover with the breadcrumbs if needed. One at a time transfer each piece of eggplant to your baking sheet. Once you’ve done this with each piece of eggplant, place them in the oven. Keep an eye on them and flip when the top is browned (about 10 minutes on each side.) Remove from oven. Preheat oven to 350 degrees. Spray a 13 x 9 casserole dish with nonstick cooking spray. Spoon some of the marinara sauce into the casserole dish and spread around to cover the bottom. One by one, place each piece of eggplant in the baking dish. I usually overlap the edges a bit. 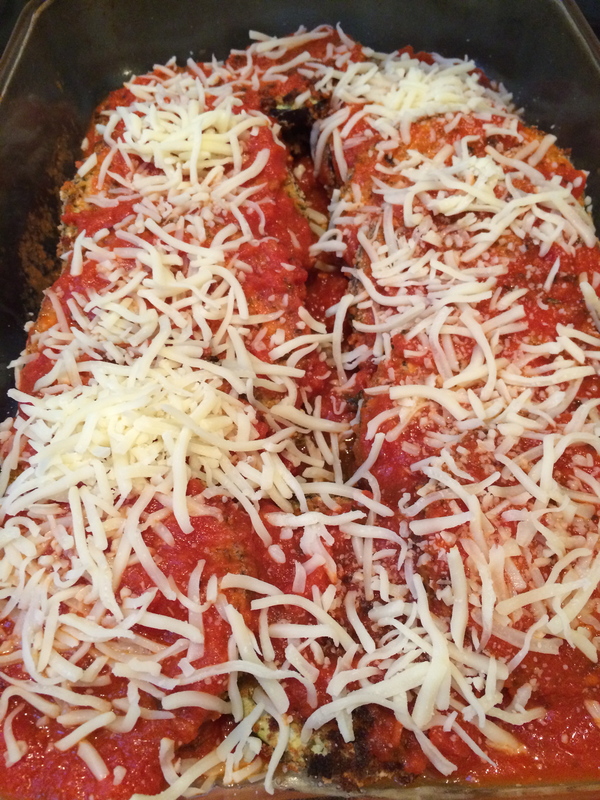 Cover with enough marinara sauce to ensure each piece of eggplant has sauce on it. Sprinkle with shredded mozzarella cheese (as much as you like). Bake for 25 to 30 minutes until cheese is melty and sauce is bubbly. Makes about 6 to 8 servings. Serve with whole wheat pasta, extra sauce, parmesan and red pepper flakes. I also usually serve this with a side salad or green vegetable. The red and green would make a beautiful holiday plate. Here I sautéed zucchini slices with a bit of olive oil and salt and pepper. It was delicious. 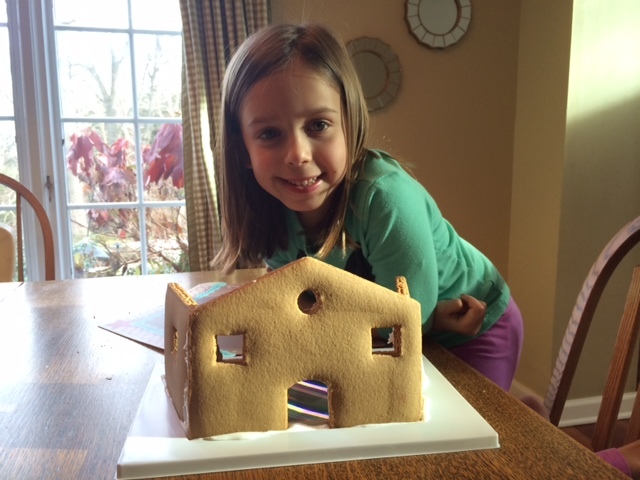 Gingerbread House Fun & Cookie Kit Giveaway! 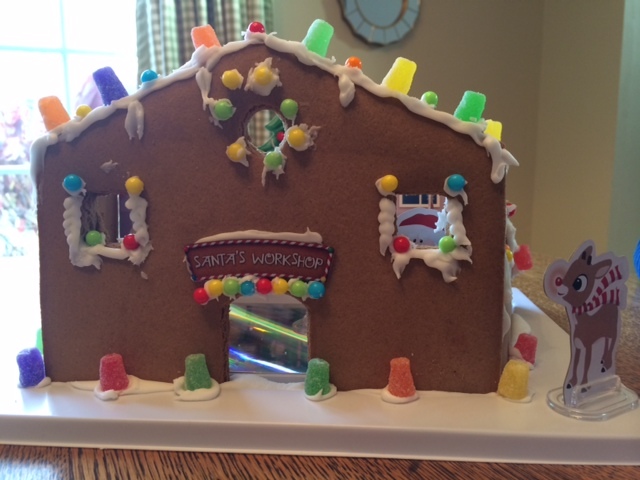 One of my favorite holiday traditions is decorating gingerbread houses. However, baking the gingerbread itself never seems to be something I can squeeze into our hectic schedule this time of year. Since you don’t actually eat the house and get the satisfaction of tasting something you created, I am more than happy to delegate the baking part so we can skip right to the best part… eating, I mean decorating with, the candy! Lucky for me, my friends at Brand Castle were nice enough to send us a gingerbread house kit. And this isn’t just any kit, this is Santa’s Light Up Gingerbread Workshop featuring Rudolph the Red Nosed Reindeer and his friends and a tree that actually lights up! It was super easy to put together and we had a really great time decorating it. I’m not sure who had more fun, the kids or me. First the walls, went up! 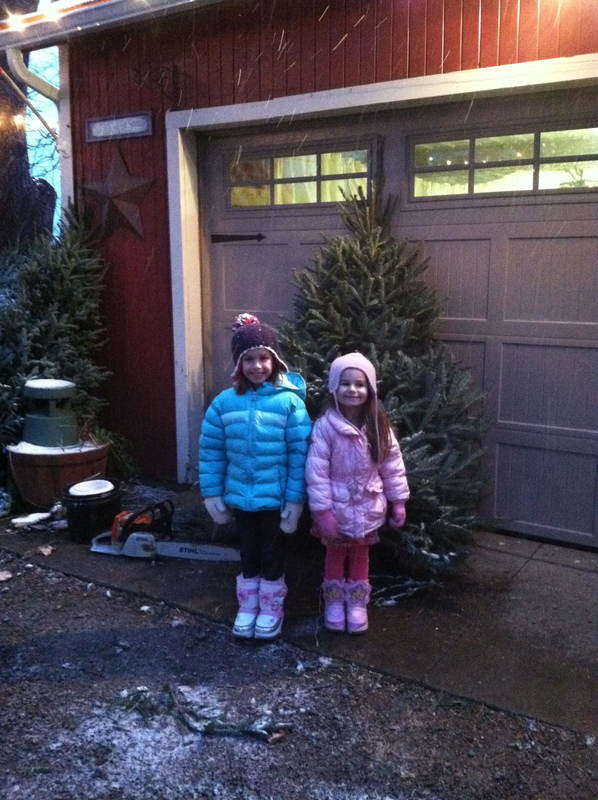 Then we slid the magic light up tree onto the back. It was time to decorate! At first we had a little bit of a tough time getting enough frosting onto the candy to make it stick. We decided to try putting the frosting into a Ziploc bag and squeezing a dollop on the bottom before sticking it on the house. Here’s where it got tricky for me, not because it was hard to use, but because I wanted to take over and make it all symmetrical and perfect looking. Why do I do that?! I set my perfectionist tendencies aside and let the kids take the reins. Apparently Elizabeth and I are even more similar than I realized, as she took over my role telling her sister and brother where to put things. Before we knew it, we were finished! Just as the kids were ready to be done. I think it turned out really cute. 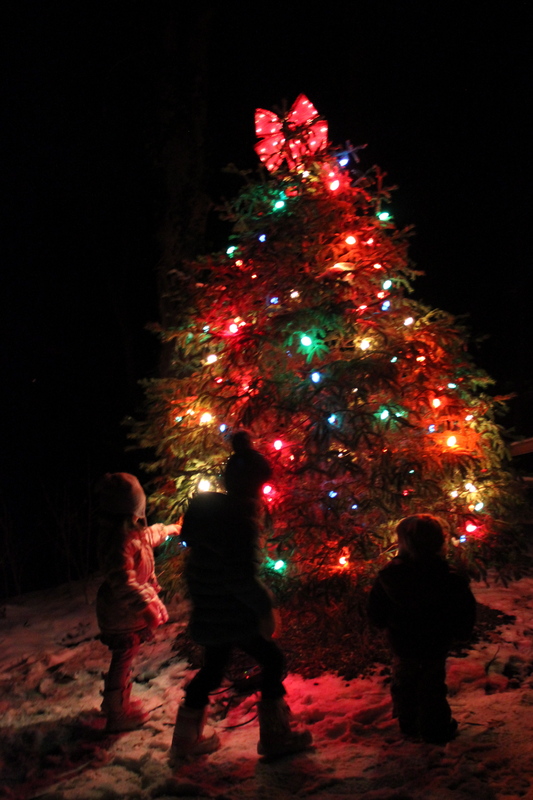 The kids LOVE the switch that turns on to light up the flashing tree lights and they’ve been playing with the Rudolph characters that come with it as if it is a doll house. My only complaint is that there is not enough of a variety of candy to use to decorate it. 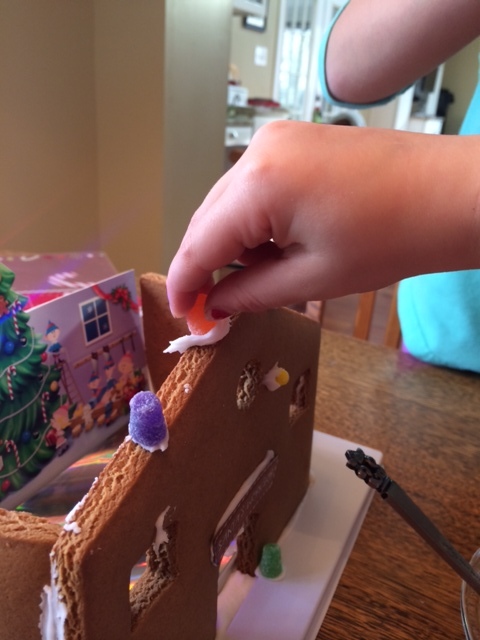 The fun of decorating a gingerbread house is having a big spread of different candies to really get creative. 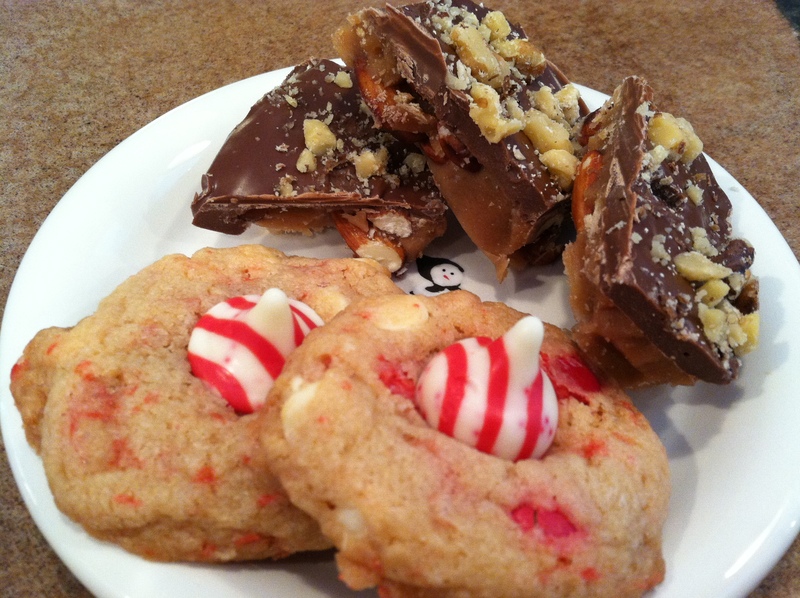 If you make this on your own, you might consider picking up some mini candy canes, some M&Ms, marshmallows, and more. Thanks to Brand Castle for sending us this adorable project. Despite some bickering over who got to knead the frosting, who got to turn on the tree and who to got to put the last gum drop on the house, we had a really fun time and created a great memory we won’t soon forget. GIVEAWAY!! 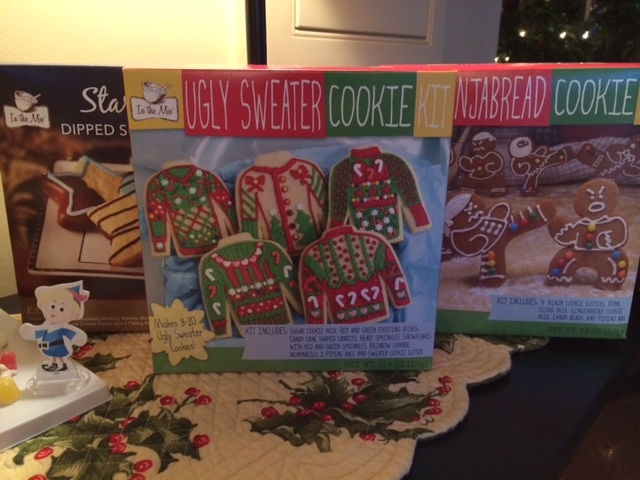 Brand Castle also sent me these hilarious other kits including the Ugly Sweater Cookie Kit, perfect for your ugly sweater party, the Ninjabread Cookie Kit, perfect for silly kids, and the Star of David chocolate dipped star cookie kit. I will be doing a gift pack giveaway including all three of these fun kits to help save you time and energy as you do your baking this holiday season. To enter to win, just comment on this post! Read more about all of Brand Castle’s baking kits and where to buy them at http://www.brandcastle.com. They are a local company based right here in Northeast Ohio, let’s support them! It’s only the first week of December, so why do I feel like I’m behind on the holidays? To be honest, I felt that way even before Thanksgiving. I mean, it was not even Halloween when I first started seeing Christmas decorations in Target, Michael’s, and The Home Depot. Are people actually buying that stuff in October? They must be or else it wouldn’t be out in stores. I usually find it pretty annoying and sometimes down right insulting, even sacrilegious, to see Santa yard ornaments back in the corner behind vampire masks and superhero costumes. On the other hand, it feels like there is SO much to do to prepare for the holidays, it seems impossible to fit it all in to just 28 days between Black Friday and December 24th. So I suppose I can see why busy moms, in particular, might want to get a jump on the holidays. I’m obviously not one of those people and I guess that’s why I already feel behind and a little stressed. I just don’t have room in my brain for Christmas until at least mid-November. There’s the christmas cards, the decorations, the lights, the wreaths, finding the perfect tree, decorating the perfect tree, finding gifts, wrapping gifts, baking cookies, making gingerbread houses, breakfast with Santa, remembering to move the Elf on the Shelf and preparing for holiday meals. I’m sure that I’m forgetting something or just not organized enough to fit it in. And in the last couple of years, I feel like there are a dozen other things I’m supposed to be doing according to what all my Pinterest friends are making, like homemade Peppermint Soap for teacher gifts wrapped in burlap with a candy cane on top, “Snowmen on a Stick” for the kids’ holiday parties at school, and handprint ornaments that look like Santa and his reindeer. Not to mention, we are supposed to cram all of this in amongst all the regular craziness of day to day life. Fitting it all into 28 days is virtually impossible. When I wrote about the contrasting feelings I’d been having about Thanksgiving in my Keep the Giving in Thanksgiving post, I talked about my frustration with the commercialization of holidays. Well, Christmas is the prime example of that, right? I wondered how Thanksgiving turned into “Turkey Day” and a chance for us all to gorge ourselves. I also wonder how Christmas, a religious holiday celebrating the miraculous birth of Christ, turned into the day when “Santa Claus is coming to town” and all our greedy little children hope to get every toy on their list. Now shoppers go out at 6:00 p.m. on Thanksgiving and fights break out in Walmart between people trying to get the best deal. It bugs me that I’m worried I need to say “Happy Holidays” instead of “Merry Christmas” in fear that I might offend someone who doesn’t celebrate Christmas. How did “the most wonderful time of the year” turn into the most stressful time of the year? Well, this week as I was walking in from putting the garbage out, of all places, feeling overwhelmed and stressed about my holiday to do list, I had a revelation. Suddenly I realized that all of this work is nothing compared to the work that God must have put into creating Christ, his gift to us. The love we put into making Christmas special for all of our loved ones dulls in comparison to the love God put into the gift he gave us on that first Christmas. All of the hustle and bustle of the holidays doesn’t even compare to the work God puts into guiding us, watching over us each and every day of our lives. As these thoughts washed over me, suddenly my view of my to do list did a 180. Instead of items I needed to check off of my list just to get them done, I realized that each of these holidays traditions should actually be an opportunity to give praise and thanks to God for his gift Jesus and for all the blessings in our lives. Did Christmas really turn into a stressful, commercialized holiday with everyone focused on checking it all off their to do list? Or have I been the only one missing the point all along? Sure, I went to church during advent and on Christmas Eve, we even lit the advent wreath with our kids and follow along on the advent calendar at home. 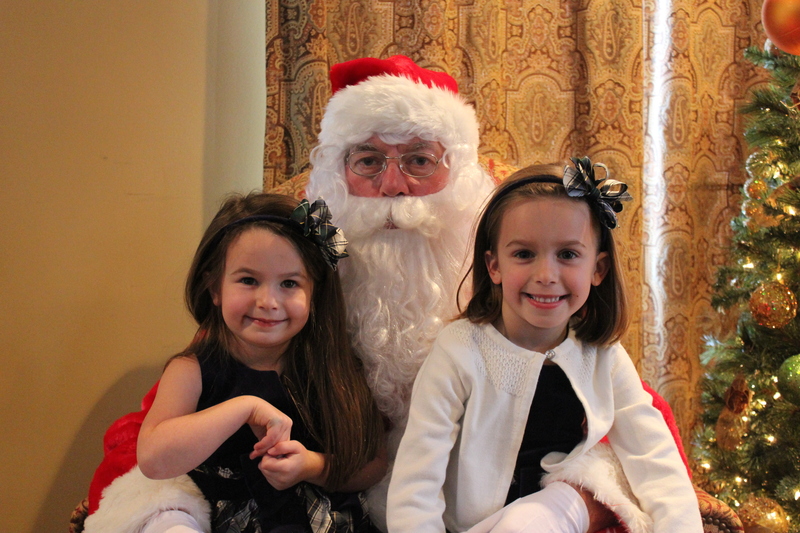 And of course I talk to the kids about remembering the “true meaning of Christmas.” But I was also the same person rushing around, stressed out, distracted just trying to get it all done to feel like I did it all right, trying to make it a memorable Christmas for them. Following all the traditions and praising God can coexist if our heart and soul stays in the right place. When I look at it this way I realize that it doesn’t matter if I don’t get to it ALL. I don’t need to make gingerbread houses AND six varieties of cookies AND make my own monogram wreath for my front door like Martha. If I can’t do it all, I should do ONE of those things and do it with joy and love and praise in my heart in celebration of the real reason for all of this fuss to begin with. Otherwise, none of those things are worth doing. 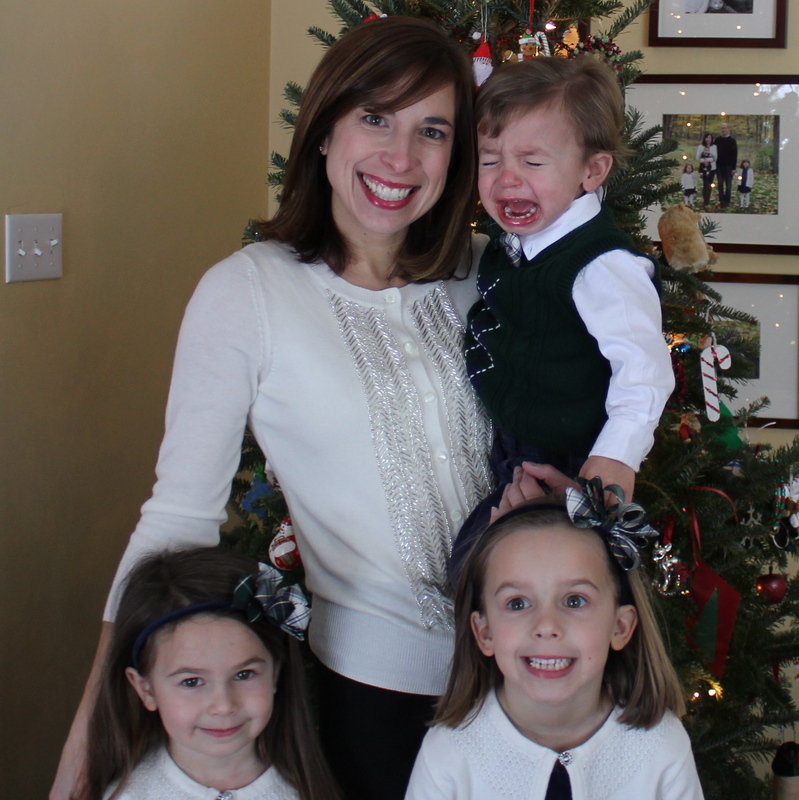 Preparing for Christmas may be hard work, but it is all worthwhile. The decorations, the cards, the gifts, the special meals, the parties; it’s the least we can do, really. So instead of looking at your Christmas to do list with dismay, try looking at each item as an opportunity to praise God for his gift to us on that first Christmas when away in a manger, no crib for a bed, the little lord Jesus lay down his sweet head. Joy to the World, the Lord has come, let Earth receive her King! Let every heart prepare him room. I don’t know about you, but I feel a little squishy after the festivities surrounding Thanksgiving. While I didn’t completely pig out, I definitely ate my share of extras. It wasn’t really the holiday dinner that did me in. My sister and her husband prepared what had to be the most healthy Thanksgiving meal one could make. Yet, it was absolutely delicious! They have been following the 30 Clean diet where they’ve cut out all grain, dairy and processed food. They both look great. I appreciate all the work they put into making such a healthy, yet super yummy meal all without overdoing it with superfluous dishes and extra fat and calories. No, it wasn’t their meal that made me feel like putting on my “Thanksgiving pants”. It was the pancakes I had for breakfast, plus the pecan pie and pumpkin roll that I made for dessert, the Pumpkin Paws chocolate truffles my mom brought, plus the birthday cake I had at my dad’s surprise 65th birthday party the next night. I did get in my own little Turkey Trot on Thanksgiving, but then spent the weekend bonding with my family instead of exercising. Time well spent. On Saturday before we left Michigan, I was looking through old photos my mom put together in a special photo book for my dad’s birthday. I noticed how much heavier I looked in many of the photos. I don’t have those exact photos, but here’s one that is a similar example. Yes, I had just had John a couple of months before, but I was about 40 pounds heavier than my goal weight. Those pictures were all I needed to help motivate me to keep from putting on extra weight this holiday season. While I currently weigh five or so pounds more than the skinniest I became after losing 60 pounds since having John, I don’t want to let that 5 pounds turn into 10 or more over the next month. So I am waging war against holiday weight gain. Want to join in with me? Here’s the menu that I plan to follow for this first week of December. If I have enough people following along, I will share another menu for each of the next five weeks. Let’s help each other stay motivated. We can follow each other’s progress through my Facebook page. Please comment on this post if you plan to join in. I am not an expert or a dietitian, but I do have the experience of losing 60 pounds and keeping it off now for a couple of years. Ok, enough talk. Here’s my plan. Rather than tell you exactly what to eat each day, I’m providing you with some options to choose from for each meal. I know I have struggled in the past with meal plans that tell me what to eat every day because some times I don’t like the option they’ve provided for one meal or I don’t have the ingredients on hand to make it. This meal plan provides flexibility in the craziness of every day life as a mother. You can pick a quicker meal or have leftovers on a night when you are driving your kids around to dance class and swim practice. You can choose different lunches based on whether you are at home, at work or running errands. I didn’t get super detailed with measurements and instructions here because they are all so simple, plus I wanted to get this out to you as soon as possible before the Peppermint Bark gets to you first. Yogurt Parfait – 5 or 6 oz. of plain, non fat, Greek yogurt with one cup of berries, mango or any fruit. 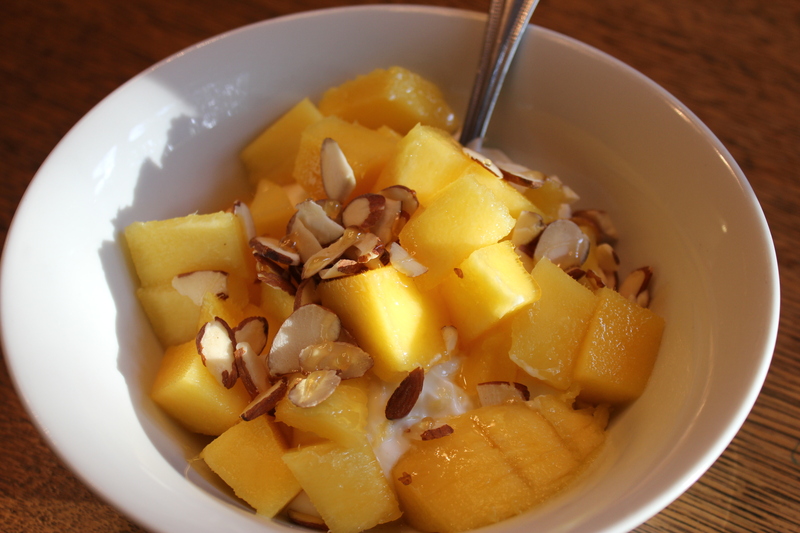 Top with two tablespoons sliced raw almonds or nuts. Drizzle with honey if you need a little more sweetness. Veggie Omelet – Saute your favorite veggies (onions, peppers, mushrooms or spinach are good) in a small saucepan. Scramble two eggs or three egg whites and pour over veggies. Fold in half when cooked. Serve with sprouted wheat toast or fruit. Cereal with Fruit – One cup of whole grain cereal, my favorite brand these days is Nature’s Path Heritage Flakes with 1/2 cup skim milk. Skip all the sugary stuff. Top with one small sliced banana. Almond Butter and Banana Toast – Spread one or two pieces of sprouted wheat toast, I use Alvarado Street Flax, with one tablespoon almond butter. Top with one sliced banana. 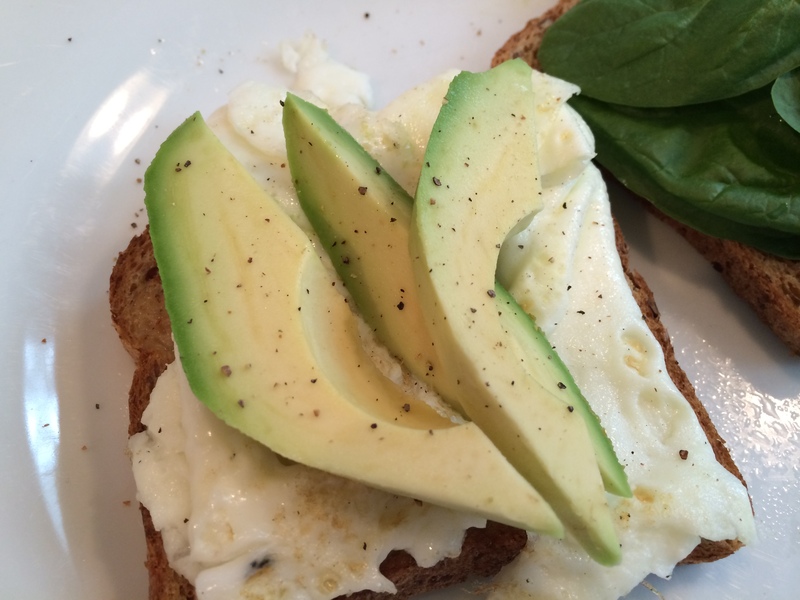 Open Face Egg White Sandwich – Scramble three egg whites or one whole egg. Spread one tablespoon prepared guacamole on one or two slices of sprouted wheat toast or smash three slices of avocado on bread. Top with 1/2 cup spinach or greens and cooked eggs. Sprinkle with sea salt and pepper. Serve with ten baby carrots and one tablespoon hummus. Salad with your choice of greens (4 cups). Top with your favorite veggies. I like to use cucumbers, carrots, olives, garbanzo beans, one hard boiled egg or 3 oz. grilled chicken breast. Almond Butter & Honey Sandwich – Two slices of sprouted wheat bread. One tablespoon almond butter or natural peanut butter. One teaspoon honey or all natural fruit spread (lately I’ve been using Crofter’s Brand). Serve with fruit. Open Face Tuna Melt – Mix one can of tuna with one or two tablespoons plain Greek yogurt, salt, pepper, lemon juice and dill. Spread on one slice of sprouted wheat toast. Top with 1/2 slice swiss cheese. Toast in toaster oven. Serve with veggies and hummus. 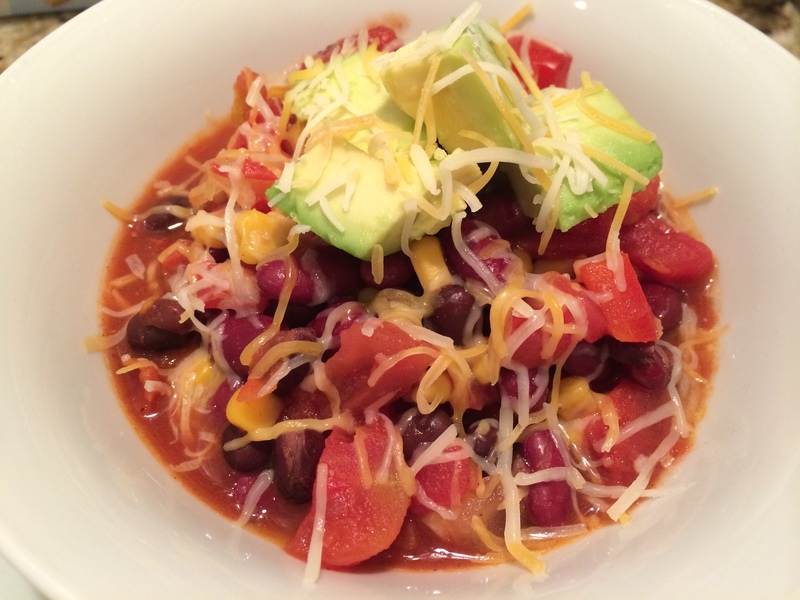 Veggie Chili – My veggie chili recipe is super quick and easy to make. Plus you’ll have leftovers for the next night. Serve with baked potato or salad. Chicken Breast baked with olive oil, salt and pepper (or Garlic Expressions salad dressing). Serve with baked sweet potato topped with two tablespoons chopped pecans and a side of vegetables. Burrito Bowl – Saute bell peppers and onions with nonstick spray or a drizzle of olive oil. Prepare brown rice and toss with lime juice, cilantro, salt and pepper. Heat canned black beans. Chop leftover chicken breast from meal above. Serve with chopped avocado and a sprinkle of cheese. Broiled Salmon with Dill – Brush a drizzle of olive oil on top of fish. Sprinkle with lemon juice, salt and pepper and dried dill. Top with lemon slices. Broil at 500 degrees for about 15 minutes or until top of fish is brown and crispy. Serve with brown rice drizzled with a bit of olive oil and salt and pepper or couscous and vegetable of your choice. If you stick to three of these meals plus two of these snacks each day, you should total about 1200 calories per day, which is the minimum anyone should be eating. Do not eat less than that or you will be hungry and cheat later on. Don’t forget to work in a bit of exercise most days. 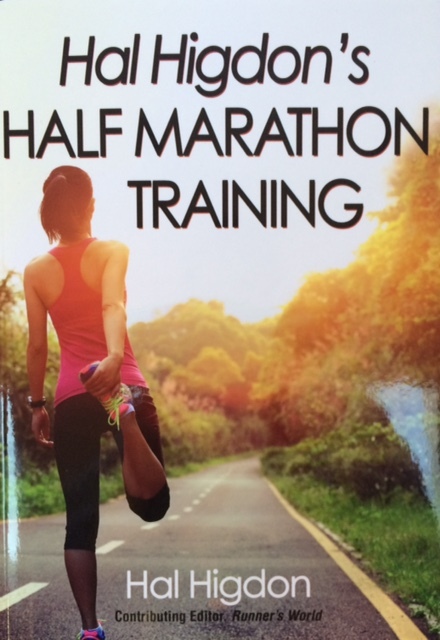 My goal is to do 30 to 40 minutes of cardio at least five days a week, plus 15 or 20 minutes of strength training. In my experience, if you try to do more exercise than this each day you will end up being hungry ALL THE TIME and you will end up overcompensating because, again, you will constantly be HUNGRY. Don’t starve yourself and don’t kill yourself in the gym. CONSISTENCY is the key! If you’re craving an extra snack after the kids go to bed, have a little something. I keep Yasso Frozen Greek Yogurt bars that are only 80 calories in the freezer or sometimes I freeze yogurt with fruit in it for a little while. It satisfies my sweet tooth and keeps me from getting into something much worse and derailing my plan. Let me know if you are following along! 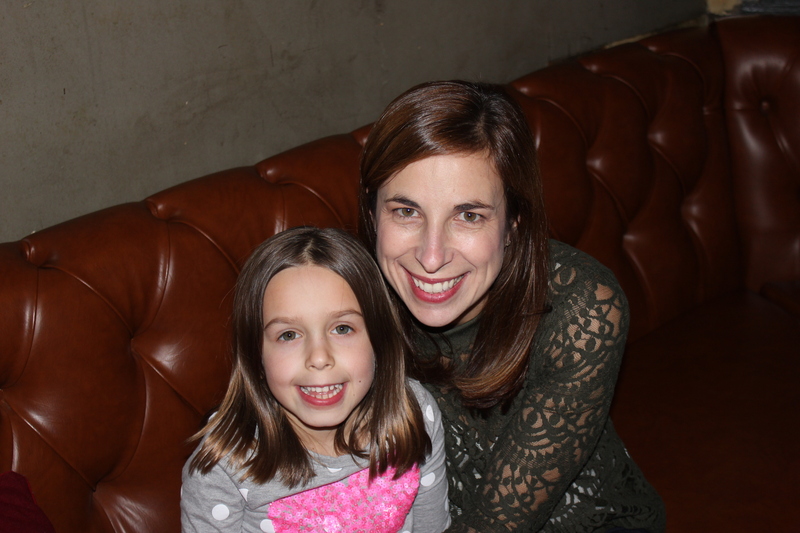 Here’s me and my big girl at my Dad’s birthday party, feeling very full. Feeling better already after starting fresh today.